Mom's Gone Bronson! : Newman's Own Organics Review and Giveaway! A couple of weekends ago we had a party for my husband's 33rd birthday, which means for around about 6 weeks he is the same age as me until I hit my birthday in October and once again claim my place on the elder throne! Every year, when I throw this get-together, I lay out a few trays of snacks and goodies for people to help themselves to and let them go to town! 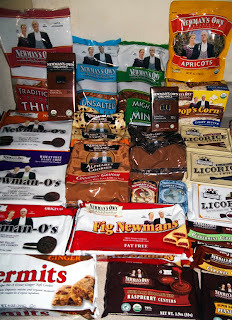 This year was no exception and in among those goodies were some sweet treats from Newman's Own Organics! 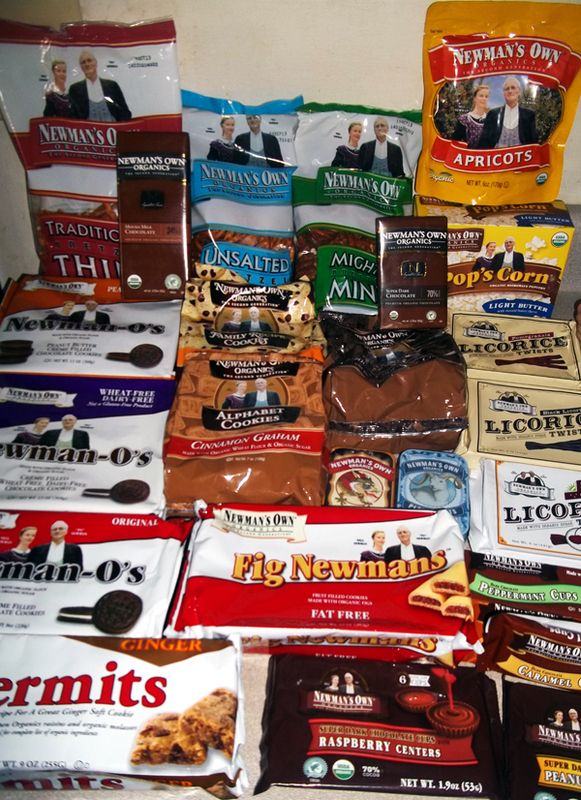 Starting out as a division of Newman's Own, Newman's Own Organics became a company of its own in 2001 - and with many delicious, organic products from Licorice to Fig Newman's it is easy to see why they are easily one of my personal favorite places to pick up snacks and treats!! The lovely folk over at Newman's Own Organics were actually nice enough to send us over a ridiculous amount of goodies to try out through out household and I have to say I am surprised they lasted as long as they did, or even made it to our party!! There were several flavors of Newnan-O's cookies, which were FANTASTIC with milk and once the packets were opened did NOT last a very long time! The Fig Newman's were also a huge hit and, again, didn't last too long on the table and the chocolate cups - filled with raspberry, peanut butter, caramel or peppermint creme made it all of about 10 minutes out of the box!! The taste of quality in each of these products was evident and more-ish doesn't even start to cover how the entire family felt about them! My mother LOVES licorice and my son loves all of the chocolates and cookies! My 2 year old's favorite are the alphabet cookies and I have to say that my favorite was the extra dark chocolate bar, which (I admit) no one else got a look-in on, at all! The only issue we had with any of the products was that some did go soft quite quickly due to the extreme heat this summer, but this is because they are all natural and lack preservatives that might otherwise make some of your other treats last forever! This is not a bad thing as I prefer the nature of each one of these products and with a little air conditioning and careful re-sealing of the packages and use of good containers, you are good to go!! Each of these products (as pictured) go delightfully with a hot cup of tea or coffee and you can't eat just the one [unless you have super will-power] but with treats as good as these you will devour them with a smile!! Each of us here in our household just ADORED this review and we know you will love these too!! Head on over to their website and see what they have to offer right now! AND see what they have to offer your pets are they do pet food and treats, too!! That's right! The good folk over at Newman's Own Organics would like to offer ONE of our readers the chance to win a selection of 4 of the items we here at Mom's Gone Bronson we able to try!! I have mulled it over for a week or so and have decided that some of the yummiest items we would love you to dig into are the: Dried Apricots, which are DELICIOUS! Newman-O's Sandwich Cookies, Alphabet Cookies AND Newman's Own Pretzel Thins! To be in with a chance of winning these goodies from Newman's Own Organics, all you have to do is enter on the rafflecopter below! Entries are open to the U.S only and if you are under 18 please get your parent to enter on your behalf! The prize will be fulfilled by, and shipped directly from Newman's Own Organics. Mom's Gone Bronson is responsible for this prize! Giveaway starts August 1st, 20013 and ends on August 15th, 2013! The winner will be notified by email within 24 hours of giveaway end and if you are chosen as our winner you will have 48 hours to claim your prize before a new winner is chosen in your place! Any question pertaining to this giveaway, please contact me via our contact form at the top of our page! Thank you so much for entering our giveaways!! GOOD LUCK, and ENJOY!! Disclaimer: Mom's Gone Bronson received products for the integrity of this review and all thoughts and opinions are honest and their own. Your thoughts may differ. Prize fulfillment stands with Newman's Own Organics and not Mom's Gone Bronson. Thank you! I'll share them with my wife.